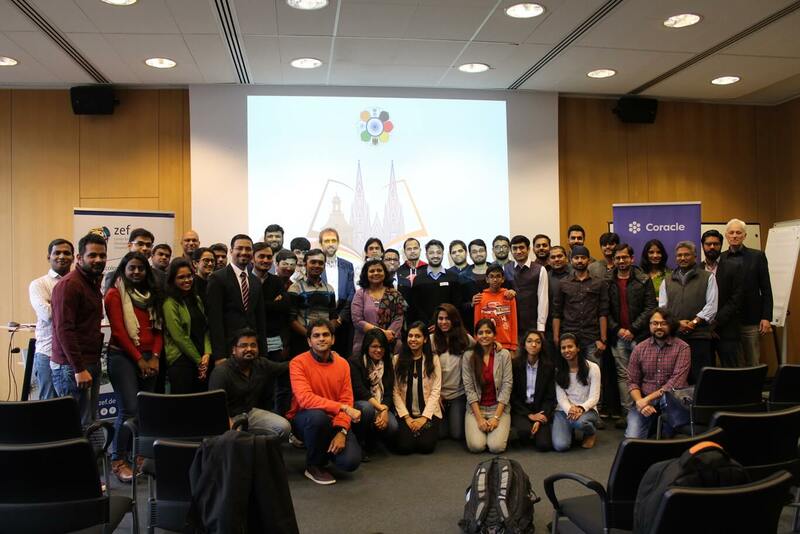 On 3rd February 2018, Indian Association Bonn-Cologne hosted the Indian Students Germany (ISG) meeting at ZEF Bonn. KunalKushwaha and Yogesh Chodvadiya took the opportunity to be the part of the meeting on behalf of the Head of Students Wing of Indian Association Hannover, Munnazzar Ahmed. The meeting was really inspirational by views of dignity, informative by the variant Indian Association with the touch of cultural and scientific prospective as the agenda of the upcoming times. It was a matter of great honour to hear the inspirational words, encouragement along with the feel of hope by Smt. PratibhaParkar, Honourable Consul General of India, Frankfurt. She discussed about the present scenario in the development of ISG website and its control by the Foreign Ministry of India. It was inspiring to see to that she was eager enough to learn about the problems that different Associations are facing. Dr. Subramanian Saravanan, Office in Charge, Economic and Commercial Wing, Embassay of India, presented a new path of scientific developments and urge of scientific aspect. The concept of giving a scientific outlook was quite fascinating, but left a doubt in my mind about its implementation in our Association’s Cultural environment. Dr. BalaRamani(Coordinator, International Office, LeibnizUniversität Hannover) brought light upon the future of ISG giving details of all the present progress in ISG on its website as well as activities. Coracle presented the schemes and help that they would provide to the children in their Health Insurance. Dr. Marcus Wiencke(Founder and Managing Director of Blubilities) gave a view of the job searching prospective and his quest as ‘Campus India’ in helping and counselling the students in the following direction. Jubin Shah presented on Waste Segregation and its necessity in India in present scenario. An open invitation was given to bring issues and suggestions for the discussion in the post Lunch session.The post-lunch session included discussions and information about various points which are illustrated later. It brought to limelight some unexpected incidents and situations. Medical procedure and list of vicinity English-speaking doctors. Services provided by varied Insurance companies. Formulation of contacts in times of emergency or for moral support. Solution for the prevailing situation of stalking or filming of girls to provide justice keeping ambiguity. Cultural Festival in Magdeburg ‘Inter Indian Association Fest 2018’ plans and support. Information about support for dispute solving with professors during project or internships. At the end, a video shoot was done by members of HISA i.e. Jubin with the help of members of different Indian Association presenting their views in their regional languages about present Waste scenario in India, its segregation and role of Indian Diaspora in this cause.